Spill The Wine Bar and Table may have changed locations but it is still just as great as before. Now located on Lake and Bryant in a new bigger location with lots of light, Spill The Wine is still one of those places that I love to go. Okay, they could do without the hokey mason jar glasses but beyond that I recently had a great experience there. One huge positive is the wonderful service. It isn’t uppity or pompous even though the food is upscale. They treat you with respect and are attentive. The servers know their stuff and can speak to every item on both the food menu and the drink menu. They can suggest and I would highly recommend going with one of their suggestions. Our server, Carli, recommended a wine flight and a certain dish that was a huge hit. The people dining with me that night will definitely be back because of the suggestions. They also help you order the correct amount of food. They have a mostly small plates menu which is meant to be shared, Minnesotans don’t really like to share. However, they do a good enough job of explaining how to eat this way that even the most unlikely people buy into the sharing. The lamb sausage and polenta. Holy moly, this is a must order. 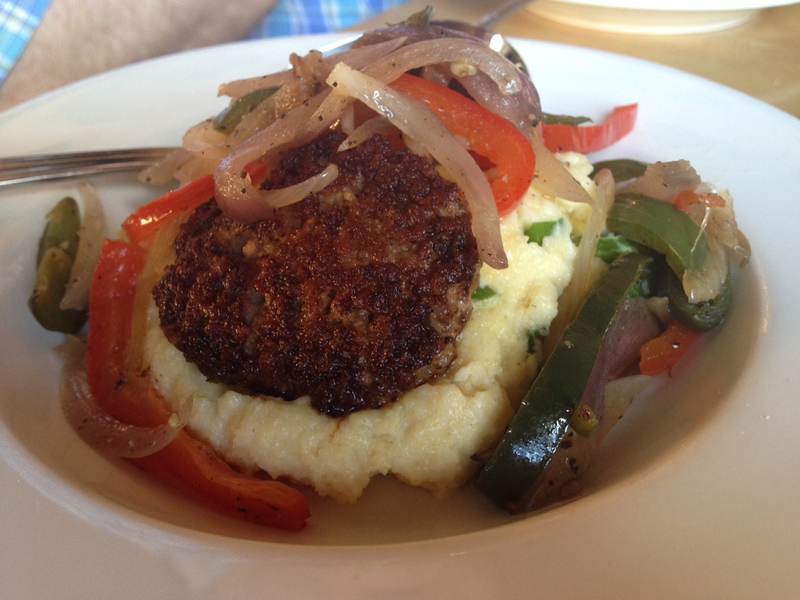 The sausage is made in-house and the polenta is nice and creamy. I could eat this every day and will be coming back to have this again. They should start selling the lamb sausage in local food markets. 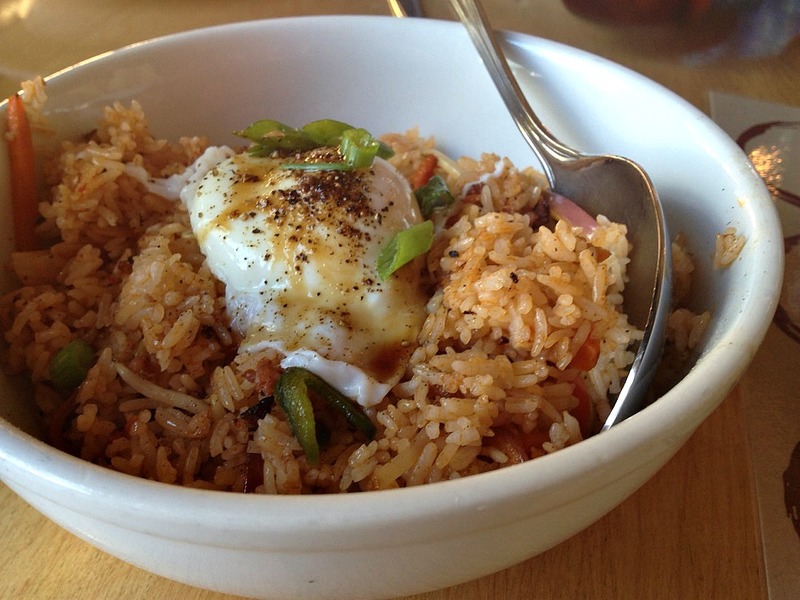 I enjoyed the Lap Cheong Fried Rice, it was a larger dish that everyone at the table got enough of to eat. My only wish was that the egg was a tiny bit more runny. 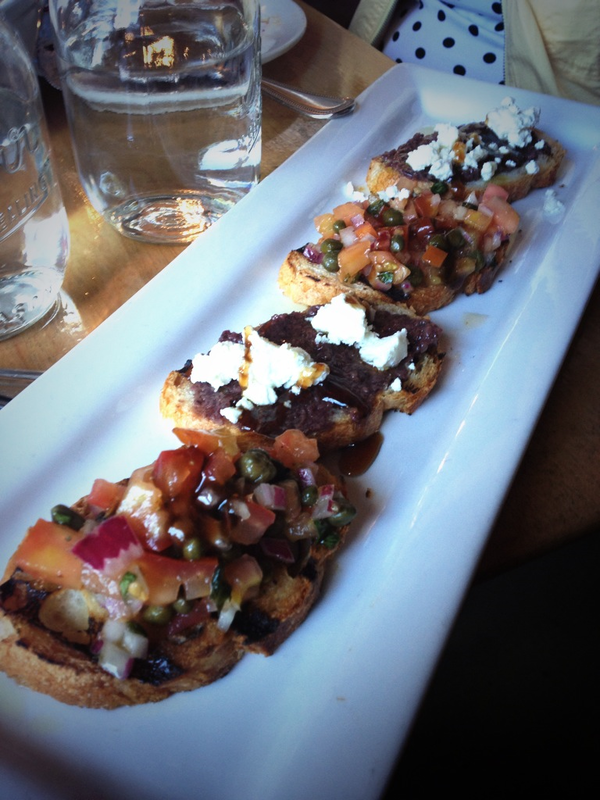 A simple thing like bruschetta can taste very good. 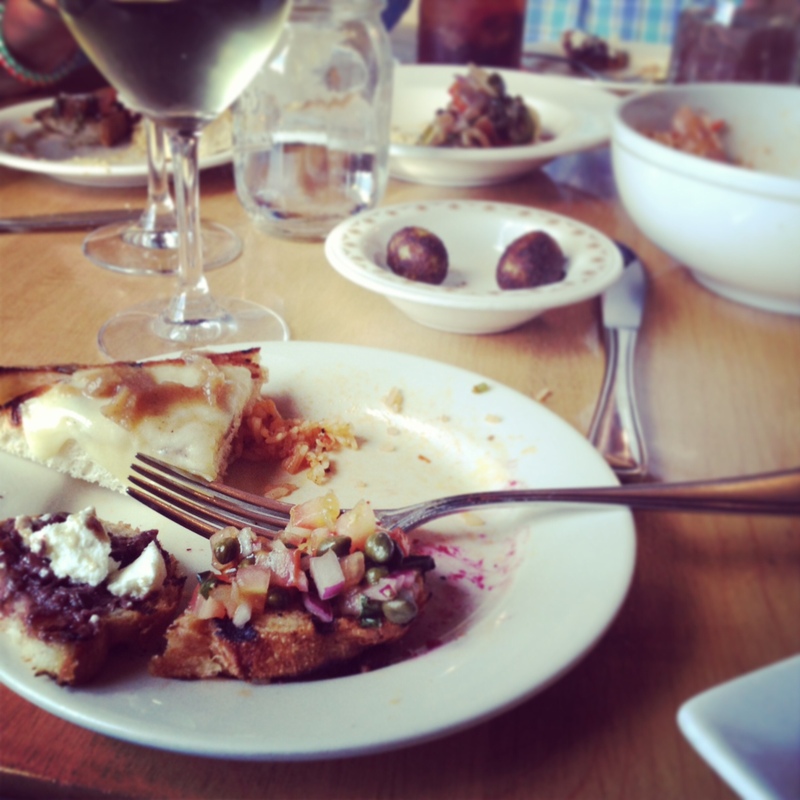 I really liked the two varieties served especially the olive tapenade. It was a great dish to break up some of the other ones. 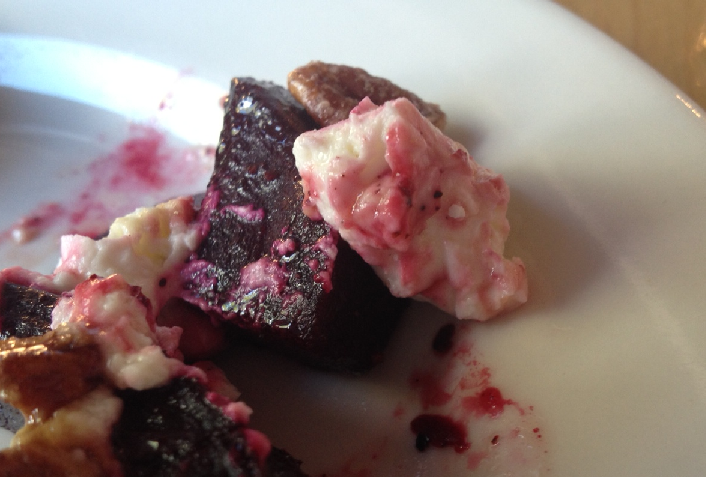 The beet and goat cheese salad. This is fairly good but was very small. I am not sure if I would order it again since it was not enough to share with four people. I want more! The fried blue cheese stuffed olives. A must order. These are fairly unique and I haven’t had anything quite like this before. They come out quickly and are a great little bite before the meal. The Simi Estate wine flight. I highly suggest that when you go here, get a wine flight. They are a great way to try new wines and get a fairly good deal. They say you only get about 1.5 glasses but I would say it is more around 2. Great wines at a great value. 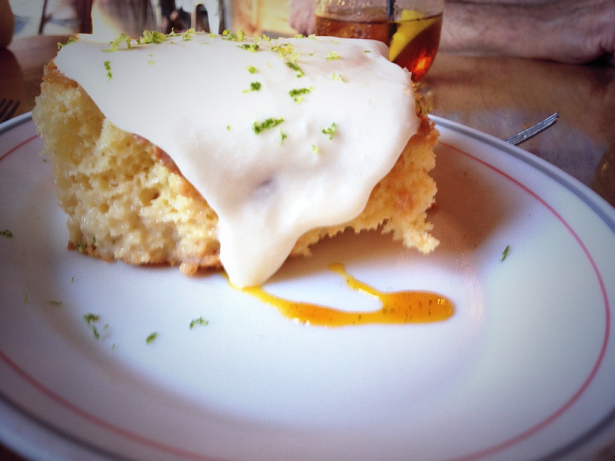 Finish the night with dessert, the tres leches cake is delightful. The fresh lime zest really added a nice touch and it was the perfect amount to share with four people. I had no idea they did brunch until I was perusing their website. Huckleberry mason jar mimosas and some patatas sounds amazing. I would, however, suggest to Spill The Wine that they have so many of these items on their regular dinner menu that they need to expand the brunch menu. I want to see some new and fun stuff that is a bit different from your regular dinner menu items that you are experimenting with, please. What are your favorite items from the Spill The Wine menu? holler at me next time you go and i’ll come downstairs — i live across the street, and it’s literally my favorite place in town. a dangerous combination, perhaps. Ummm…blogger meet up sometime this fall!?! I would love to check this out, and I love sharing! great idea katie – i’m in!! Agreed! 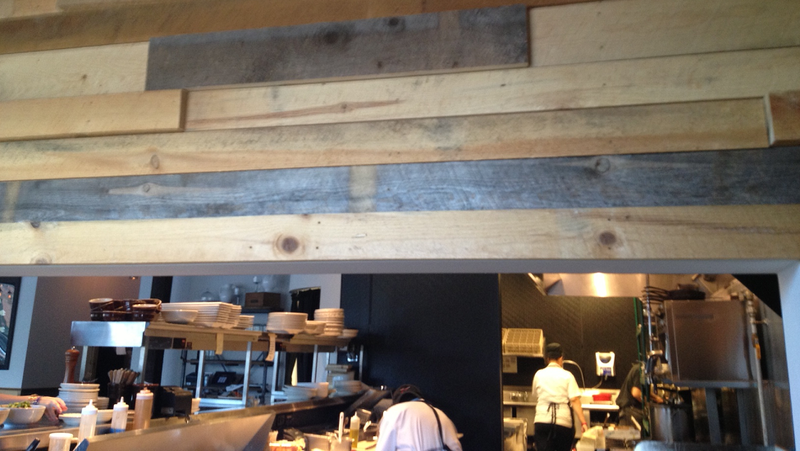 I also heard from the restaurant that they are coming out with a new brunch menu this fall.